My youngest daughter recently had a birthday! 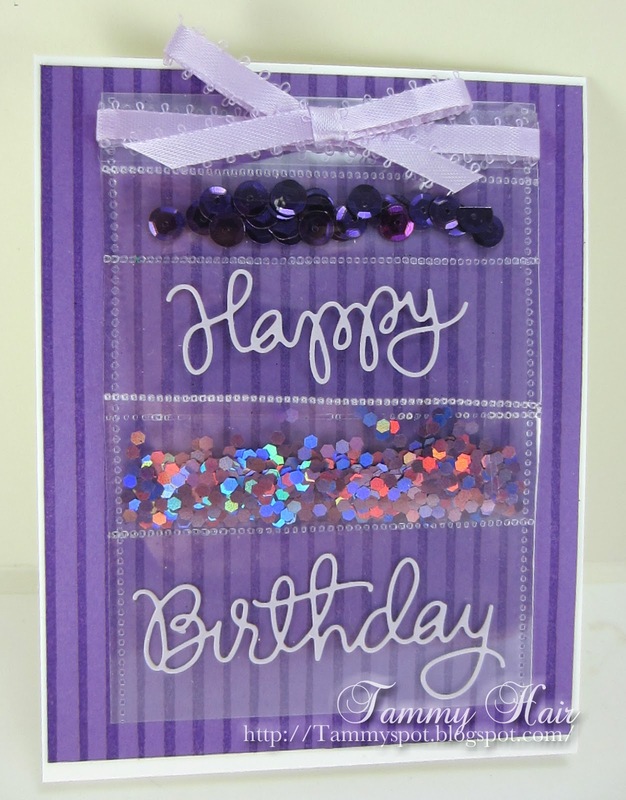 If you know her, you know this card suits her well, she loves purple and sparkles! I love my fuse tool and I love my daughters, all three of them! This is gorgeous Tammy, I love the sparkles and beautiful colours. Oh how fun!!! I love purple and sparkle too!!! :) That fuse tool is pretty cool for sure!! Love what you've done with it here!! And yet another thing I'm going to have to blame you for when my husband asks, "So now, what's a fuse tool and WHY do you need one?" 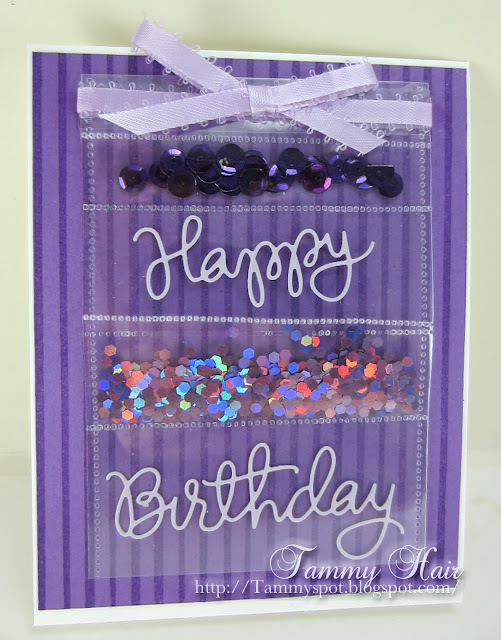 Gorgeous card Tammy..love the sparkle and bling and you cant go wrong with purple for a girl..Happy birthday to your daughter..
Gorgeous! I love the colours & I love all the little pockets! Cool concept - might need to look into getting that tool! I love all your fun "fuse" creations, Tammy!! This shaker birthday design is so festive! Gorgeous card Tammy, I'll have to look into this "fuse tool." How lucky to have daughters...all that sparkle and bling! What a perfect card for pouring on the festivities Tammy! Your fuse tool is looking very useful! I might have to check that out. I have enjoyed using my acetate and clear cardstock but always have to do something tricky to cover the seams. I like how this seems to work. Really pretty card, Tammy, and happy birthday to your daughter! Oh Tammy, superb! My oldest's favorite color is purple, too - and she loves her sparkle, a la Taylor Swift style, lol. This is a blingy gem of a card, I'm sure it was a big hit! What a sweet mommy you are ;) Happy Birthday to your dd! This looks great! Love how you combined the sparkles and the dies. Such a great and fun card. I need to figure out how to incorporate this new tool into my scrapbooking!